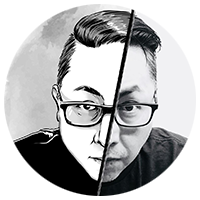 Resumé (PDF) Designer, Illustrator and Writer with over 25 years experience in the art, design and entertainment industries. Immediately after high-school, I started working nights at an animation studio while taking college art classes during the day. At age 19, I started my own independent comic book company with my two best friends while learning layout and design on the job at a sports newspaper. Eventually leading to a full-time career in graphic design working with some of the world's top brands and clients. I am experienced in design for both digital and print. Including art direction, design, illustration, copywriting and concepting for digital marketing campaigns, social media, site content, pitch decks, web design, motion storyboards and publication layout and design. I cut my teeth in animation but my true love has always been comic books. I'm the writer, artist and creator of "The Ghouly Boys" comic books series. My illustration portfolio includes work for Disney's "Haunted Mansion" comics, Marvel sketch cards, artwork for the Bay to Breakers marathon and social media artwork for film campaigns. As a comic book creator, I wrote my own stories, including work on "The Ghouly Boys", "Haunted Mansion", "Tales of Hot Rod Horror" and more. Aside from writing for comic books, I've written film and television treatments for Benderspink, Film Colony, Nickelodeon, and others. I've also done copy writing for social campaigns, pitches and product packaging. Adobe Creative Suite (Photoshop, Illustrator, InDesign, Dreamweaver), Clip Studio Pro, HTML, CSS and several Web Content Management Systems. Art direction, design, illustration, pitches and copy writing. Unfold is a digital agency that specializes in social campaigns, banner ads, digital content and web design for top tier companies. Clients include: Annapurna, CBS Films, DC Comics, Disney, Dreamworks, Fox, Goldenvoice, Hulu, Lionsgate, Netflix, Paramount, Showtime, Sony, Ubisoft, Universal, Warner Bros and others. Other duties included providing on-demand social content for award shows and concerts, as well as escorting media/press during live events. Website management and design. Maintained websites via CMS and HTML as well as front-end graphic design. Also provided graphic design services for web banners, sweepstakes, social media, enewsletters/eblasts and campaign key art. Other projects for AEG included: AEG Worldwide, AXS.com, Bay to Breakers, Fight Night Club, L.A. LIVE, Los Angeles Sol, Nike 3on3, Ritz-Carlton Residences, StubHub Center Foundation and others. Formerly a comic book publishing company, now the design and illustration studio for my freelance projects. Comic Book Writer/Artist for "Three","Tales of Hot Rod Horror", "One Night Stand" and others. Graphic Design and illustration for Upper Deck/Marvel Comics, U.S. Soccer, Let's Play Sports, Base Camp Adventure Lodge, Carpenter Community Charter School, Copa Del Mar, Kold Energy and others. Contributor for "Haunted Mansion", "More Strange Eggs", "Slave Labor Stories"
Contract and contract-for-hire staffing agency for marketing and creative. Anthony Robbins Foundation, ASD/AMD Trade Shows (VNU), Encad, Legal Arts Multimedia, Metabolife, National University, Third Eye Designs/Stoorza Communications and more. Graphic design agency specializing in the sports industry, specifically soccer. Animation studio for film and television. Projects: Animated television special for CBS and Saturday morning cartoon series produced by Marvel Productions for FOX.